The Coocon Aeris Fire in polished steel. We have ours hanging in the window, but it can go anywhere. As long as most of the screws in the bracket go into a beam it’s fine. Steel is £770 more than black, but it’s Marine Grade polished steel & can be used outdoors – & will look amazing next to our Christmas tree when we put it up. We have it lit most of the time (afternoons & evening). The first thing we noticed is how long the burner lasts – about 6 hours! It really warms up the showroom as well. 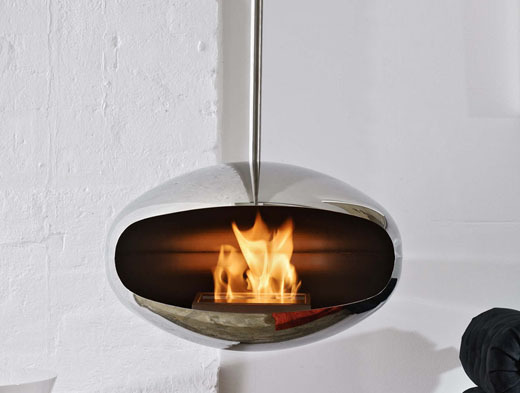 Delivery on these bioethanol fires is fast too. See the Cocoon Fires collection here. After pressure from John, Claudio & Franco we have finally put the ever popular Bonaldo Big table in the showroom. We have the version with a solid walnut top & the classic red/green/lilac/orange legs & it looks amazing. I remember seeing it in Milan when it was first released & loving it, & it seems our customers also love it. We are showing our table with Bonaldo’s clear Poly chairs, but definitely need to choose some new ones. See Bonaldo’s collection here. 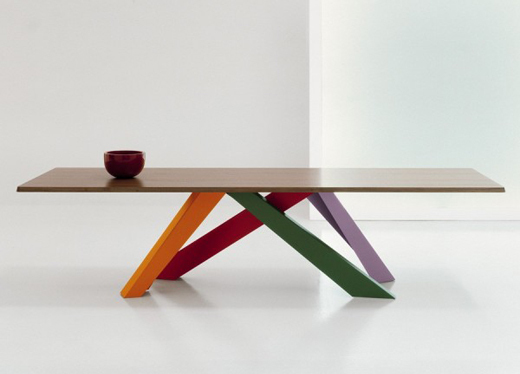 The Gulliver 2 console table from Tonelli Design. An all time classic, ours is being used as a desk & has white drawers (which must be a new thing as they arent an option on our website at the moment – which will be changed). 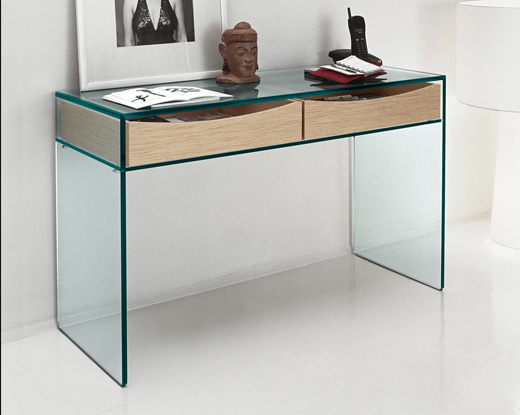 When you see this console table ‘in the flesh’ you can see why an Italian made glass console table is worth investing in. Toneli Design produce amazing quality glass furniture, & weirdly, we have far, far fewer breakages/damages than we do with other (non glass) collections. See the Tonelli range here.